Hello again, as promised I want to finally share with you some sneak peek pics of one of my current projects. 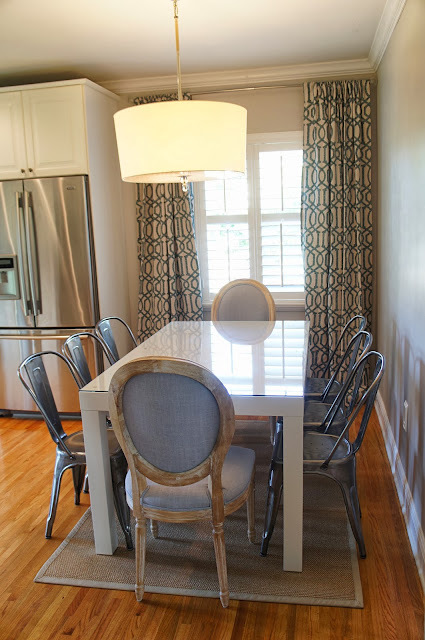 Remember when I posted about a home that was in need of a little updating love here? Well, there has been some progress in the home. It's actually almost finished minus some items on back order. Take a look at the space when I started below. The home before lacked light and flow. 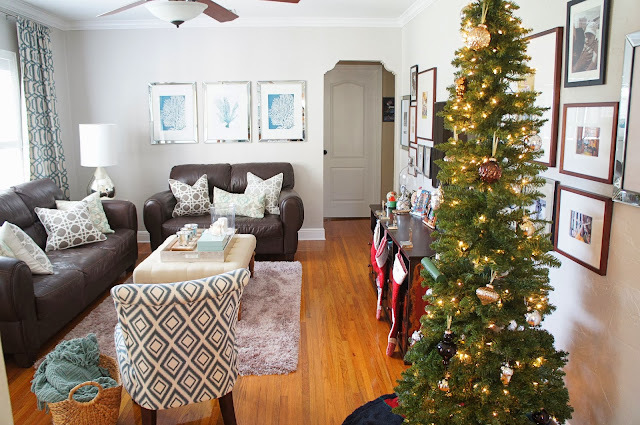 It had too many dark furnishings, and since it is such a small space it also needed some changes in scale with the furnishings to make it feel lighter and less cluttered. Take a look at the space in progress with it's new fresh paint and all of the lighter pieces. It's important to note that this project was done with a minimal budget so I had to really be creative where I spent, and I also had to use some of the existing pieces to save cost. 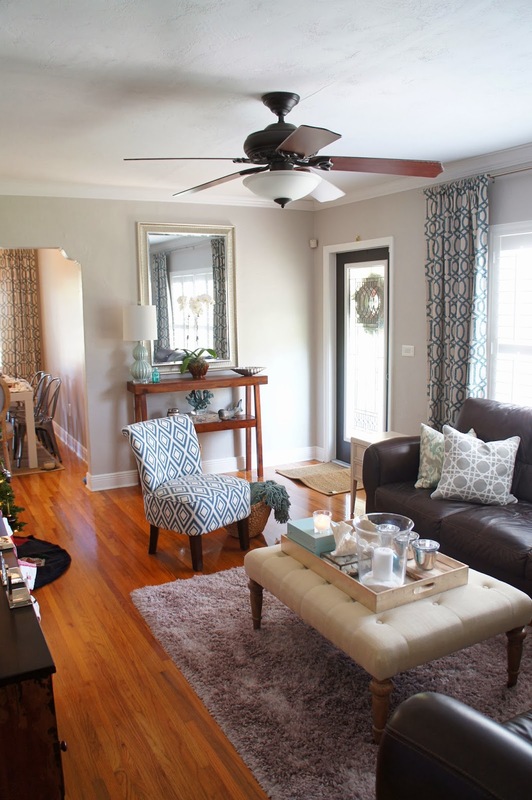 Here are some notable changes in this room. ~By unifying the colors within similar pallets, but mixing up the prints it really gave a pop to an otherwise pretty monotone scheme. Don't be afraid to mix your prints. By doing so you create character and visual interest. ~The new freshly painted grey walls instantly inject brightness in to the room, and also instantly updated the older beige walls. Never underestimate the power of paint!!! It is one of the most cost effective ways to update a space and/or brighten the space. 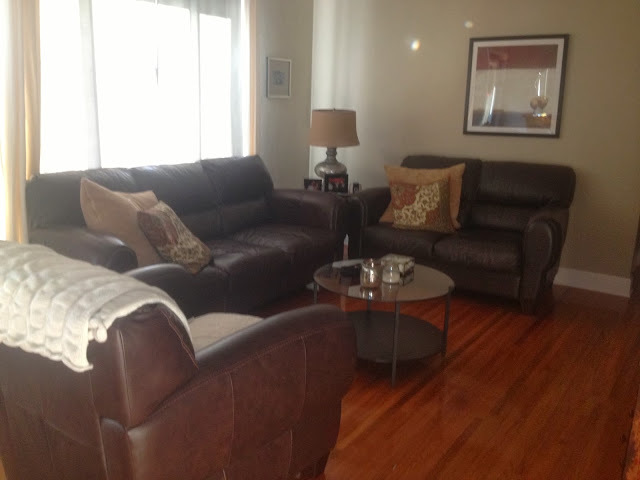 ~I used a smaller scale chair which replaced the client's old brown leather chair. The new chair provides seating while opening up the walk way and giving the illusion of space. 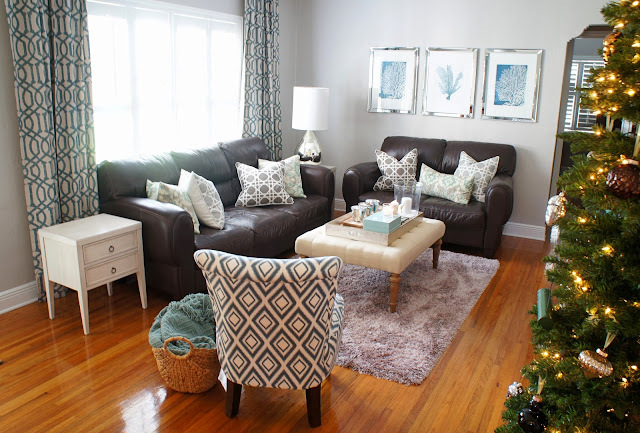 It is also a mixed material and print so that things aren't so "matchy matchy" As a rule of thumb try for no more than 2 matching pieces in a room. Any more and it becomes something straight off the furniture store floor. 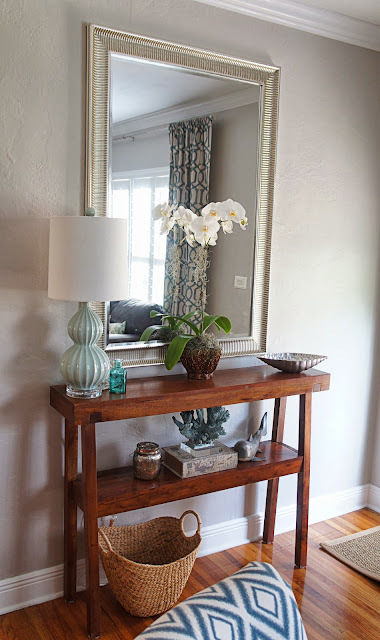 ~In the entry I used the client's existing console, but because it was so small scale and had a small mirror as well as too many frames I instead added a very tall mirror to open the room up. Mirrors also always make a room seem larger. I cleaned up the accessories and unified that area with the rest of the space. 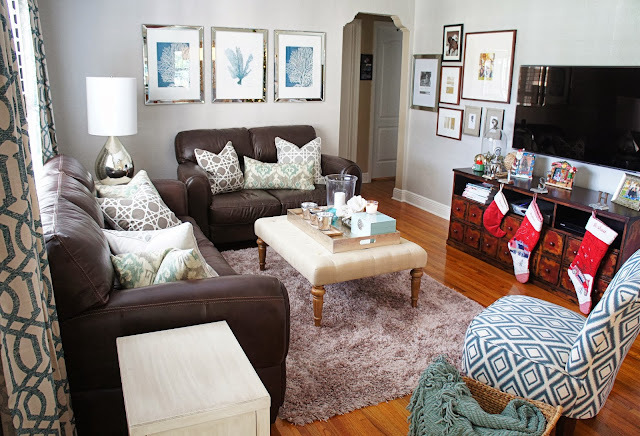 ~I replaced the too small coffee table with an ottoman which was a mega sale score! 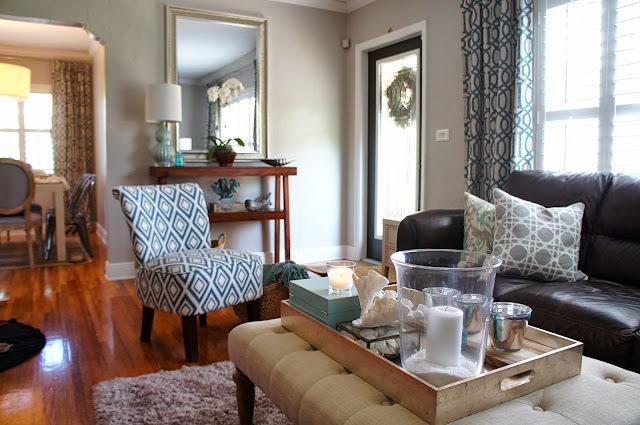 I love that it's again another material, but with the light cream fabric and some silver accents like that tray it's the perfect coffee table/stool. I'm sort of obsessed with it. ~The last notable change in the room are the art and picture walls around the TV. Since this is a young growing family my client has many family photos. By adding an interesting picture wall all around the TV, which is what you see right when you walk through the door it actually masks the TV and makes it an interesting focal point. Everyone loves a good picture wall! The mirrored frames on the opposing wall are pretty touches above the heavy leather sofas. 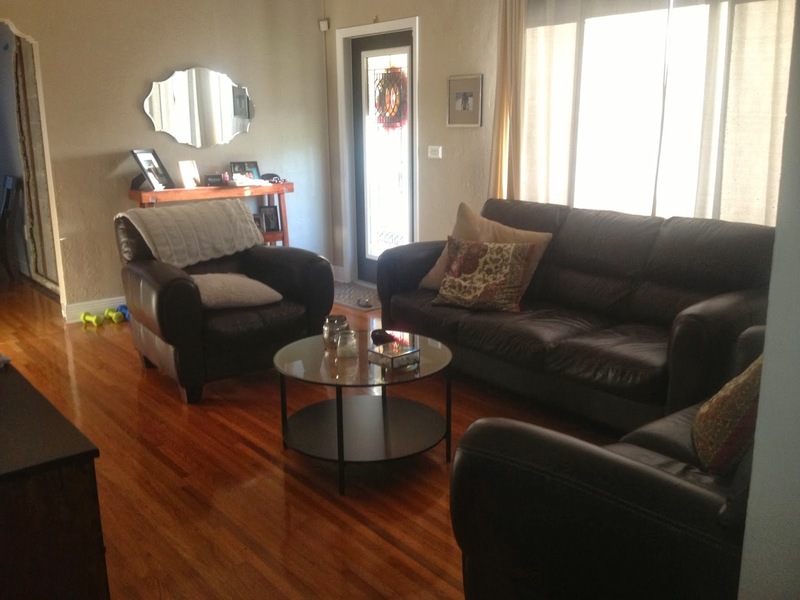 Since you can see the kitchen and dining room from the family room I unified both spaces. It's still being finished since the lighting is on back order, but since you already have a sneak peek in some of the pictures here's a better shot of that room in progress. More of that to come soon as well as better detailed shots and images of the kitchen. Probably after the holidays though. 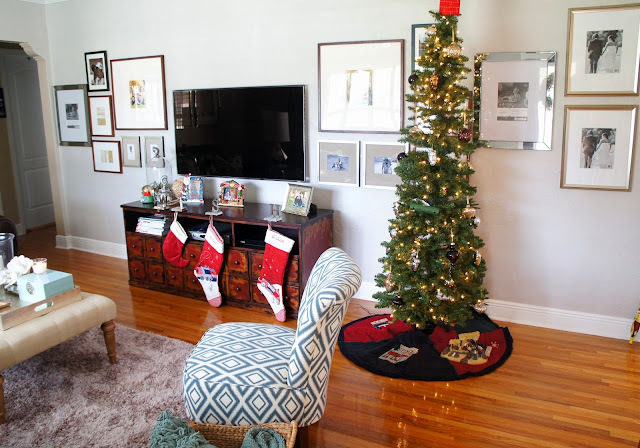 Speaking of the holidays, I plan to show our new Perez family Christmas tree this week. I won't lie, it's sort of amazing!!! I'm so excited for the holidays. I just returned from New York for Thanksgiving and can tell you for certain that it is "the most wonderful time of the year"! That place will really put you in the mood.